You amaze me with your use of new technology! I like the way the bird flies in one ear and the leading red lines project out the other at the tip of the fingers. I don't know what it all means, however there's certainly a look of pleasure on the face of that beautiful lady! Hi Steven. This part of technology is fun--not much different from paper and pencils. It's just a step up from Etch-a-sketch. I do need to learn the right way of printing these--I know nothing about drop boxes or clouds or even cell phones (I use mine for emergencies).. Thanks for the comment. I would love to visit the right side of your brain. Ha! I've heard that before but I think I'm actually very logical. I drew and painted a face in the middle of the page; then I added things. Love the way his face looks! Really neat and the way the bird appears to be about to fly into his ear. I think with that slight smile it is tickling him! Hi CrimsonLeaves. I couldn't decide whether this was a man or woman--me, maybe, or Bob Newhart; the face reminds me of someone. Whoever is lacking eyebrows and wearing a fluffy cotton ball wig. Perhaps it's a founding father or mother--there's red, white and blue. I actually thought it was a self portrait, it reminds me of you, in any case , just love the freedom in your creations ! Hi Jane--it probably is me--it's the face I know best. I probably should add some wrinkles. I need the freedom in art; the rest of my life seems to be responsibility. oooo you can always be relied upon to produce something cool! This does look like you, I think...and it is fun to try to analyze it...It makes me think of the expression "a little birdie told me (it's your birthday...or whatever!). This little birdie is telling you something about those red lines. Or maybe it makes me think of the expression "in one ear and out the other". Anyway...I love your paintings--they always give me a lot to think about. I'm going to check out this app! Thank you Celeste. I actually have earrings--"in one ear" and "out the other." A gift my daughter made just for me, I wear them often. For a while the face had a cat dangling off the side. I liked it but the page was horizontal--needed something to fill out the sides. Surrealism is, in my view, always such a important part of your work whether or not you intend this to be anything at all. Clearly it tells the story of fusing art with technology and the process for you is logical, artful and fun. Love it! You amaze me always. Hi PAMO. I don't think about surreal when I'm working on a piece; I see it later. And I've decided that that's exactly what I should be doing, so I'll keep having fun, especially with iPad art. Thank you, Pam. Hallie, I love where you go with these things.The elaborate pattern on the face is intriguing. The hair looks like a traditional watercolor, so that is a pretty impressive piece of software, but it takes an artist to use it well. Everyone has made some very insightful comments. Thank you, Mary. You're right--the hair was done with the watercolor brush; so were the gray and black parts. You might like this app. It has watercolor brush (only one size) pencil, marker, pen and eraser--you'd know how to use them all. Fascinating piece and I admire your ability to the iPad app. I haven't gotten into that at all. Too cheap to pay for apps! ha ha I thought of this as a heron and then thought about hearing - perhaps the heron is telling the person to listen to something important? Thanks Rhonda, and good point about the apps--but I get to sit down (no backache). So today I worked out at the Y. You know, this picture is disturbing. This is because we are on the same wavelength (so to speak). I painted a psychological self-portrait weeks ago - I've been staring at it trying to figure out if it is done - which, hold steady now, has a wavy red line going through my head. So when I finally get around to posting it (or, - throat clearing - posting at all) and you see it, do not think I stole it from you. I did not. We were on the same curvy red wavelength. Go figure. Beautifully done by the way. So original - as always. Uh oh, Dan, not a good wavelength. 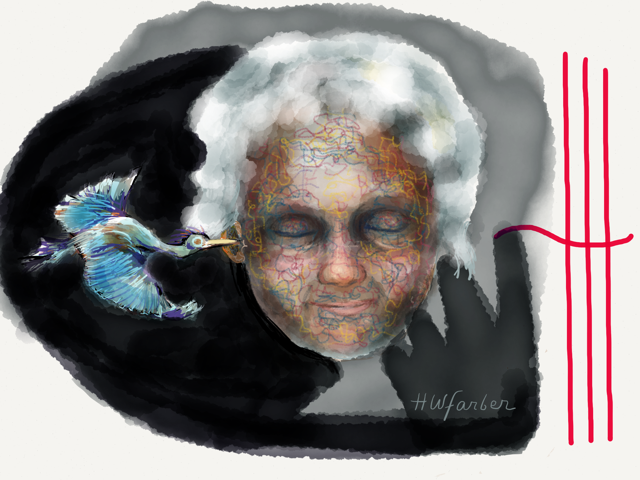 I added the bird and red lines because I thought the head looked a bit coffin-esque. I'm seeing your painting in my head--electro shock treatment? One Flew Over the Cuckoo's Nest is a favorite movie. We're waiting for the post--it's been a long time. My goodness, you really get a lot of comments. And I'm pretty sure it's 'cuz you're so funny and kind. I keep thinking I need an Ipad but I'm sure I'd waste too much time with it. Hope your puppy is fine. Hi Sue. You should get an iPad. Because of you, I'm getting a golf cart in the Spring--they're street-legal here in town. Willie is good--he's got me trained. He gets down the front porch steps okay; later, he barks and I go out and carry him UP the steps. Remarkable work Hallie, I didnt have a clue you could accomplish so much on the I pad, I have to see if I can try this kind of work. Personally I have a message through this work..serendipitous I guess.. Thank youi Padmaja--I'm glad you got the message. I know your art and I think you always get the message. Before iPads I played with Corel on my desktop, so I couldn't wait to try the drawing and painting apps. There are many good ones, even free ones like SketchBookX (a good place to start). Hi Hallie, Interesting image and I was fascinated to discover you did it on an iPad. I'm gonna check that app out. Hi Caroleking. Since you sketch NYC you might really like this. I also use like Procreate and SketchbookPro. Each app has advantages. You are getting to be one fine techie, Haillie! I'm going to have get me an ipad soon but it has to wait until I find a new camera as my old one is on it's last legs. Sigh. Well, Carole, I'm far from being a techie. My iPad is just easier to find than pencils and paper. Photos with my iPad (I use it to photograph my paintings) are as good, quality-wise, as the ones taken with my Canon G11. No zoom on the iPad, though, and I can't hang it around my neck.